Nan Lewis is a creative writing professor at Acheron College in upstate New York. Tormented by the tragic death of their young daughter on the dangerous bend of River Road, her husband Evan left Nan to crawl inside a bottle every night. In the evenings after teaching, Nan still hides there from her writing, which she blames for her negligence when a car came around the bend too fast towards her little girl. Now history is repeating, and everyone believes that Nan was the drunk behind the wheel. All she can remember is arguing with a fellow professor over not getting tenure, and having a drink, maybe two, before leaving the faculty party. Convinced it was a deer she hit that night, and not her beloved student Leia Dawson, who Nan overheard arguing with her boyfriend, Nan seeks to prove her innocence to the responding officer and the town. But piecing together the truth about Leia Dawson becomes entangling as professors, students, and an array of people reveal truths not only to mourn a loss, but to solve a murder. In this book are mentioned several great novels that Nana discusses with her students in their class: Jane Eyre, Wuthering Heights, The Odyssey, the works of Alice Walker, Dante, Proust, Chekov, Carver, Hemingway, Junot Diaz. 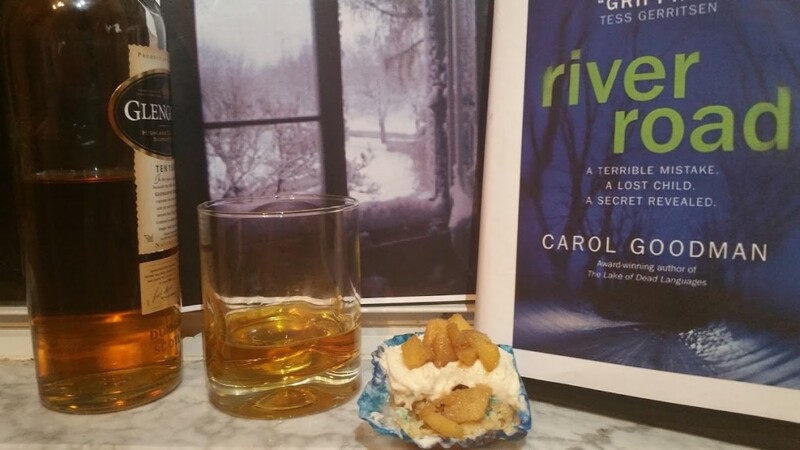 There are also mentioned several more modern authors and stories such as: George Pelecanos, Richard Price, The Dark is Rising, 4.50 from Paddington by Agatha Christie. Carol Goodman has written many other books, including The Ghost Orchid, Arcadia Falls, The Sonnet Lover, and the one most like this novel as well as being her first: The Lake of Dead Languages, about a professor at a women’s college whose roommates were killed when she attended there, and the events of that last night are suddenly being recreated after a page from her journal which documented the events appears in her file box. She has also written a Young Adult fiction series which begins with the book Blythewood. Another good murder mystery recently written is the new Kate Morton novel The Lake House. It tells the story of a detective working on a cold case of a two year old boy who disappeared from a grand house in the 1920s, and the family who left not long after, each with only pieces of the story, and of course, their guilt. Nicholas Sparks also wrote a book about a hit and run called A Bend in the Road, which alternates narration between a man whose wife was killed in the accident, and the unnamed killer, grappling with his guilt and desire to be honest with the man he’s hurt, to whom he’s more connected than we realize. Nan called scotch “the taste of forgetting, of oblivion.” And apple trees and blossoms were repeatedly mentioned surrounding the area of Nan’s home and the cottage. Also, a bottle of whiskey was left for Nan at the site of the crash where Leia was killed. 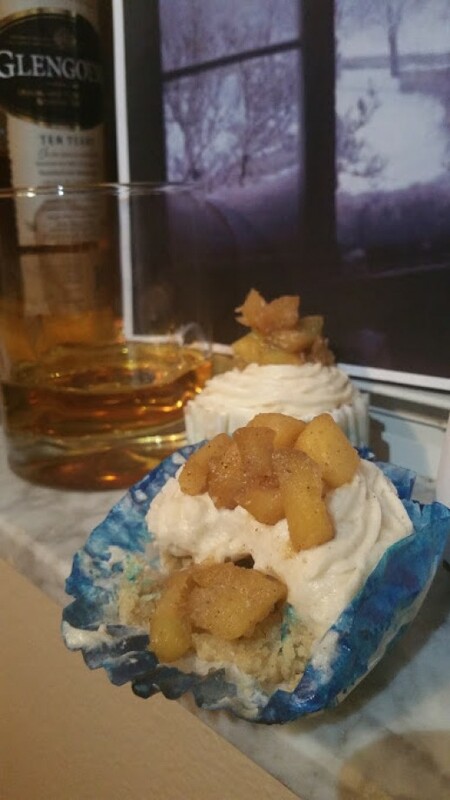 To combine these elements, I created Apple Bourbon Brown Sugar Cupcakes with Cinnamon Whiskey Frosting. Preheat oven to 350 degrees F. In a medium sized saucepan, brown the 4 tbsp of salted (do not burn) butter on medium low heat. Cook the diced apples in the butter until soft. Add 1 tsp of whiskey and 1 tbsp of brown sugar to the apples and stir until both are melted and combined with the apples. Remove from heat and cool. Combine AP flour, sugar, brown sugar, ½ tsp cinnamon, baking powder in a bowl. Into this bowl, whisk ½ cup melted butter, 1 tsp vanilla extract, 1 tbsp whiskey or bourbon, ½ cup half and half, and the 3 eggs. Line a muffin tin with cupcake liners, and add about 2 tsps of batter to the bottom of each cupcake. Then add about a tsp of the apple mixture. Then top with another tsp of batter. Bake in the oven for 18-22 minutes, until the cupcake batter is cooked all the way through. Set the cupcakes aside to cool on a rack for at least ten minutes before frosting. To make the frosting, in the bowl of a stand mixer, whip on medium speed 1 cup of softened unsalted butter for about 2 minutes. Stop the mixer and add 1 cup of powdered sugar, and 1 tsp of vanilla extract. Mix on medium-low for about thirty seconds. Stop the mixer and scrape down the sides of the bowl with a rubber spatula if needed, then add ¼ tsp of cinnamon, another cup of powdered sugar, and 2 tbsp of whiskey or scotch. Mix on medium low for about a minute or until all ingredients are fully incorporated. Turn the mixer down to the lowest speed and slowly and gently add the last cup of powdered sugar and ½ tsp of whiskey. Stop to scrape down the sides if needed. Mix on medium for about a minute. Pipe onto cooled cupcakes, and top each cupcake with a few pieces of the cooked apples. What do you think of the Victorian tradition of reading ghost novels on Christmas Eve, as mentioned by Nan when she was in the woods after hitting the deer? Was this an appropriate time to be thinking such dark thoughts, as ghost tales would be on Christmas eve? If you have time, look up this tradition, as well as what tales were typically told or would have inspired such a tradition. Nan’s mother wasn’t overly affectionate or nurturing. In fact, she is quoted as saying to her daughter, “I’m not one for shows of emotion, darling, it doesn’t mean I don’t love you.” How did this shape Nan’s personality, or even her sense of loneliness, depression, and suicidal thoughts? How might have Nan’s life turned out differently if her mother had been more nurturing, or her stepfather’s family more including of her? Cressida admonished Nan about crying often at work, or in front of male coworkers, insisting, “Men will judge you if you cry…They’ll think you’re a hysterical female and you won’t get tenure.” Was that why she hadn’t gotten tenure? Was her stoicism how Cressida had gotten it? Cressida compared losing Leia to Nan’s loss of her child. When tempted to balk at the difference, Nan instead thought “I hated when parents-like my stepsisters-acted like single women without children were somehow less worthy than those who had wedded and procreated.” How did this show great kindness, wisdom, and Nan’s true nature? Why was Nan so gracious to others, but not herself? Ross “was known for his relaxed, affable style in the classroom…It’s a performance. that’s the only way to engage these students. You have to emote. Sometimes it just drained the life out of me.” Are all teachers drained from teaching at the end of the day, and if so, and they love it, then why? Or for professors like this, where there is less behavior management, arguably, than with elementary school, why did Ross feel he had to perform to captivate their attention? Did Nan? How did the author help you to better see and empathize with a professor’s perspective? Which professor’s class (in this book) would you have liked to take? Why? Some people have a bad feeling in their gut when something terrible happens, or is about to. Nan had no such inclination with her daughter, but was instead absorbed in writing. She compared it to a star that has burned out galaxies away. “It was like knowing that the worst thing could have happened already but you didn’t know it.” Would a thought like this have created paralyzing fear in Nan, which may have been the cause of her drinking problem, and her writer’s block? What could she have done to overcome such fears and thoughts? Nan quoted Margaret Atwood in her classroom, that “All writing is motivated deep down by a desire to make the risky trip to the underworld, and to bring someone or something back from the dead.” What, or whom, could Leia have been trying to bring back, perhaps from her childhood? What about Troy? Ross? Cressida? Are there any authors for whom this might be true, some that tried to immortalize people, places, or memories for all time? (Hint:one such example is given later in the book when Cressida quoted at Leia’s memorial: “so long lives this, and this gives life to thee”). When visiting the quilting circle at the prison, Leia wrote “I find that the women are more likely to tell their stories during the quilting circle when their hands are busy and their eyes are bent down to the scraps of cloth we are piecing together.” What about this quilting circle creates a safe sort of place to speak about their pasts? And is it only shame that keeps their heads bent while they speak? Ross was infuriated by Leia’s chameleon-like tendencies, especially towards him. “every time her folks moved she’d try out being a different person. She said it was like practicing to be a writer, making herself into a new character to fit her surroundings.” Was this merely sport for her, or do you think Leia was trying to find her own identity as well? Was it possible that writing was the only definitive part about herself she had found? Or was she trying on different faces and understanding different lifestyles only to use them to write about later? What did Troy probably think? Nan’s mother told her that “an excuse is worse than a lie, for an excuse is a lie, guarded.” How was she right? What excuses had Nan been making? Were there any her mother was guilty of? What did it say about her mother that she “had become a therapist to cope with her own crippling anxiety”? Might that be why Nan chose to be a writer-to cope with the loss of her father and isolation from her family? Why were people so quick to assume that Ross and Leia had been having an affair? Why did they, as he said “want to make it into something so ugly” because he took “an interest in a student…because she’s remarkable, because she reminds you of yourself when you started writing, when you had that fire in your belly.” Why do most people equate passion or affection with romance? Aren’t most of our relationships non-romantic? “It was the taste of forgetting, of oblivion” is what Nan called the taste of scotch. Why would she want to immerse herself in this and to forget? Were there other ways she could have found to forget her troubles? Why did she choose this one? Nan admitted that after a dream about nearly drowning, she “felt the weight of the dead tipping me toward them, as if I were standing on one end of an ice floe and they were standing on the other, weighting the balance so I would slide down into the icy water.” Why did she feel that way, even after she awoke? Was it true, or just her perception, or did she want it to be true? Why? What made her want to live? For Nan, Christmas morning was “when the past came back to haunt us.” Why was that true for her now? Had it always been (think about her relationship with her parents). Is it true for all of us, or do we make it that way, or not, depending on our thoughts and actions? Cressida calls social media a quote from Virgil: “a monster with a hundred eyes and a thousand tongues beneath each wing.” How is that an accurate description for what it did to Nan, to Ross, or even to celebrities now? What do you think of Cressida’s theory about why Jane Eyre hears Rochester’s voice at the end of the book (if you haven’t yet, read Jane Eyre)? What do you think Nan’s theory about it would have been, or Leia’s? Do you have your own theory? Was it something the author did to make her writing more like her sister’s novel, Wuthering Heights, perhaps as an idea they shared to include supernatural or metaphorical elements in their stories while they were writing them or brainstorming ideas? Nan agreed that Leia “could be very demanding. They all are, this generation…” Why was she that way, as so many other students at the college appeared to be? For more info about generational types and characteristics, read Generations: The History of America’s Future. Are there similarities between Leia’s generation and the Boomers/hippie generation? Nan had told her students that “everyone’s the hero of their own story, never the villain.” How was this true for each of the characters? Is this how they could each justify doing some of the terrible things they did? Troy, with a police officer’s wisdom, noted what “a crime like that [the death of Nan’s daughter] does-it breaks people-it breaks places.” How was Nan broken each time someone she loved died (think back even to her father’s death). Can people be put back together after a loss like that, and if so, how and by whom? How can a place be broken by death, and how can that be repaired?